I think there are few things that my family loves more than peanut butter. If a peanut butter recipe pops up on Facebook, there's about a 100% chance someone is going to tag me in that post. To say we are peanut butter connoisseurs would be an understatement. With school back in session, I didn't want Allison to get bored with regular peanut butter sandwiches in her lunch box each week, so I thought I'd try Golden Blossom Honey's spin on a tasty Peanut Butter Spread recipe I saw on their website recently. I'll be honest here and say that I usually turn peanut butter into something a lot less healthy. Cream cheese, vanilla, sugar, whip cream are all such yummy mix ins, but this recipe is just the opposite. 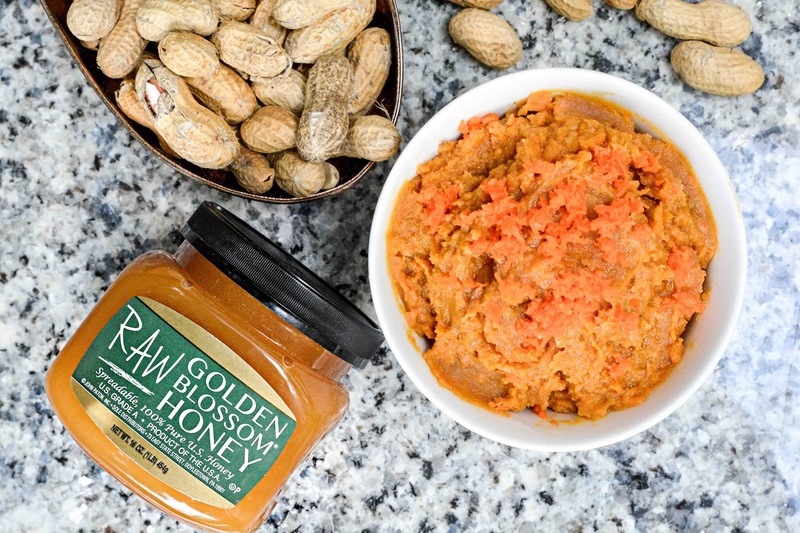 Nothing but carrots, yogurt, vanilla and raw honey are mixed into the peanut butter, making it not only a delicious spread, but a healthy one too! I was a little concerned that it was going to taste "too healthy", but if you've ever had a peanut butter mousse before, it's really quite comparable. It tastes so much like a dessert spread instead of a nutritious snack. Spread it on bread, crackers, pretzels, grahams and fruit. It's all good! If you make this, do it in small batches because I think it tastes best fresh. I did refrigerate my left over spread and it didn't have the same "pow" factor as a freshly whipped up batch, but thankfully this can be made in under 2 minutes, so making it fresh whenever the cravings hit shouldn't be an issue. How do you dress up your back-to-school sandwiches? this is very interesting... I never tried peanut butter with anything else much except chocolate hahahaha... healthier anything is always good. thanks for this recipe! Making it in under 2 minutes is sure a win. Get it done, chow down, and away you can go. Craving nixed. Anything that gets done that quickly on a busy school morning is a win in my book! The joys of tummy troubles :( You and me got it rough, that's for sure. Though, I did give my dogs a little sample, they didn't poop all over, so you might be ok :) Isn't that bottle the cutest? Well, not as cute as honey boo boo bear, but still pretty cute! Sounds awesome! A healthy snack that the kiddo's will enjoy, yay you! I don't have children in school but I do try for healthy for my grand children as often as possible! Thanks for passing it on. That sounds really good. I like peanut butter on celery sticks and crackers but never thought of it with carrots. That sounds good. We have ours on toast a lot. travis grew carrots, so this would be perfect for us to try. While I love peanut butter as well, I've never really used it to make a spread like this before. I'm intrigued by this recipe as it would be a great way to get some "hidden" veggies into my littles and it sounds delicious! What a great way to get those kids to eat veggies! I love this idea. It looks yummy! Yumm! Your peanut butter spread sounds delicious! I usually eat beanut butter with apples but my daughter loves it on her toast. My family absolutely loves peanut butter too so this will be a big hit in our house. This looks like such a great recipe. We will definitely be whipping up a batch of this. This Peanut Butter Spread looks yummy and carrot has magnified the nutritive value. Oh my! I love peanut butter spread. And this one looks so delicious! 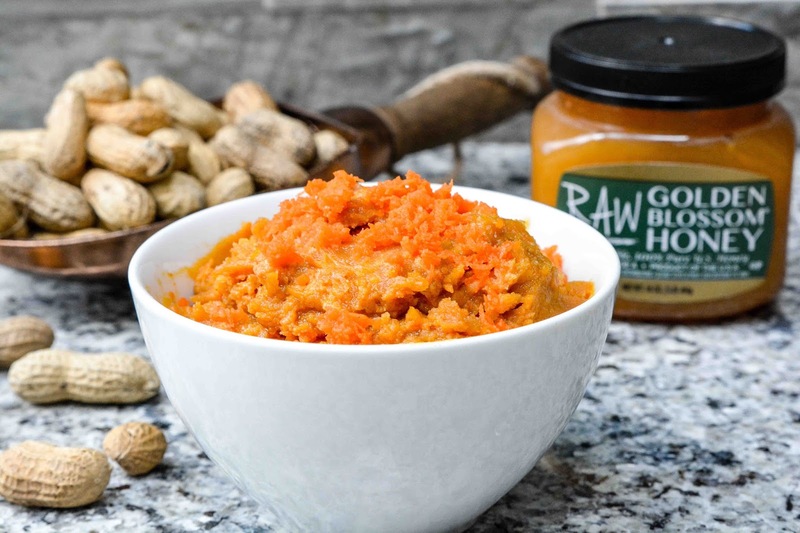 Never tried peanut butter and grated carrots together before, but this would be an interesting spread to try. I am saving the recipe and make some soon. I think my husband would love this for his late night sandwich fix. carrot and honey on top! That's interesting..love to try it.. I have weird kids - they don't like peanut butter?!? How can you not? I might just have to make this for myself. Looks yummy! My daughter's boyfriend doesn't either. I'm like wtf! Who doesn't like peanut butter. He said if his dad gets a smidgen of it in his Nutella, he'll throw the whole jar out. Talk about weird! Well, I've been missing out, Theresa. I thought adding fig jam to a peanut butter sandwich was creative! You've opened a whole new peanut butter world to me. I nearly always use honey in the homemade smoothies I make, so I'll have to give the Golden Blossom Organic honey a go the next time I buy honey. I love how you showcase your featured products with beautiful photography! You always come up with the best ways to use honey!! We love peanut butter, so this is a good one!